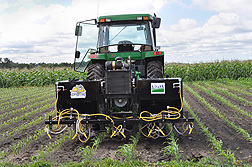 Tractor-mounted system for spraying corn grit to shred the leaves of weeds growing between crop rows. It can take real grit to control tenacious weeds. Although determination is an important attribute in farmers, Agricultural Research Service agronomist Frank Forcella is counting on grit of another kind in his approach to battling weeds. In collaboration with South Dakota State University (SDSU) researchers, Forcella has devised a tractor-mounted system that uses compressed air to shred small annual weeds, like common lambsquarters, with high-speed particles of grit made from dried corncobs. Ongoing field trials may foretell of the system’s potential to help organic growers tackle within-row infestations of weeds that have sprouted around the bases of corn, soybean, and other row crops. Dubbed “Propelled Abrasive Grit Management” (PAGMan), the system disperses 0.5-millimeter-sized grit particles in a cone-shaped pattern at the rate of about 300 pounds per acre, using 100 pounds per square inch of compressed air. An SDSU engineering team built the machine under a grant Forcella was awarded from the U.S. Department of Agriculture’s National Institute of Food and Agriculture. “For the first few weeks of the growing season, weeds are relatively small, and that’s when we target them with the grit,” says Forcella, at the ARS North Central Soil Conservation Research Laboratory in Morris, Minnesota. The crop plants escape harm because they are taller than the weeds, and their apical meristems (growing points) are protected beneath the soil or by thick plant parts. 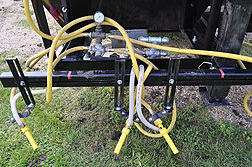 The tractor-mounted system uses compressed air to spray corn grit onto weeds growing between four rows of crops simultaneously. Nozzles work in pairs to control small weeds by shredding them. ARS scientists were able to control 80-90 percent of weeds with two grit applications at two crop growth stages. Current organic weed control methods include flaming (or scorching), soil tillage, and hand-pulling, among others. Still, weeds remain a chief agronomic concern requiring new approaches, says Forcella. This summer will mark a second round of field tests of PAGMan on multiple rows of silage corn grown on 10-acre plots of certified organic land in Minnesota. “Last year, in corn with its full complement of weeds, we were able to get season-long weed-control levels of 80 to 90 percent using two treatments of the abrasive grit—one at the first-leaf stage and the second at the three- or five-leaf stage of corn growth,” Forcella says. Corn yields compared favorably to those in hand-weeded control plots. Initially, PAGMan consisted of a hand-held nozzle and compression hose hitched to a grit-filled tank on the back of an all-terrain vehicle. The tractor-mounted version, built by SDSU professor Daniel Humburg and former graduate student Cory Lanoue, uses an air compressor to pump the grit through eight custom-made nozzles capable of covering a four-row area. Ground corn grit that can be sprayed on weeds to shred their leaves. 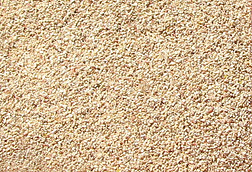 Each grit grain is about 0.5 millimeters in diameter. Forcella has published results from earlier, small-plot studies in Weed Technology and other peer-reviewed journals. Results from the 2013 field trials were presented this year at the Weed Science Society of America’s annual meeting by SDSU graduate student Mauricio Erazo-Barradas and professor Sharon Clay.—By Jan Suszkiw, Agricultural Research Service Information Staff. This research is part of Crop Production, an ARS national program (#305) described at www.nps.ars.usda.gov. Frank Forcella is with the USDA-ARS North Central Soil Conservation Research Laboratory, 803 Iowa Ave., Morris, MN 56267; (320) 589-3411, ext. 127. "Whacking Weeds Organically" was published in the July 2014 issue of Agricultural Research magazine.